Four Elements Nutrition | This blog is about nutrition, broken down into four elements: healthy eating, culinary arts, philanthropy, and research. All entries are by a registered dietitian who is passionate about all things related to food. This blog is about nutrition, broken down into four elements: healthy eating, culinary arts, philanthropy, and research. All entries are by a registered dietitian who is passionate about all things related to food. When I was a child, I had a considerable sweet tooth. There was no cake, cookie, or chocolate bar that escaped my clutches and I often explored the nooks and crannies of my Mother’s pantry or fridge for leftover treats from parties and gatherings. When I was seven years old, I had gained enough weight to tie me over until high school so our family doctor put me “on a diet” of mineral water before meals, and absolutely no sugar in any of my foods. My Mother decided that if I wanted something sweet for dessert, I could have raisins or dates. This is where my love for dates began and has remained unwavering since. I remember sitting down to afternoon tea with the grownups, feeling so proud that I could sip hot tea loudly and eat as many dates as I wanted. As a dietitian today, I may suggest exercising a certain degree of portion control when it comes to dried fruit, but including dates in the diet can add a great deal of nutrition, taste and variety, especially if you have a sweet tooth like me. Date Bliss Balls are easily one of the most popular desserts among those who are aiming for a healthier dessert option, and many recipes are also suitable for those following a vegan or gluten-free diet. With so many variations on this chewy, decadent treat, it’s easy to experiment with different ingredients and flavours. I’ve always wanted to try my hand at creating my own recipe, so I think I finally achieved a variation on the Date Bliss Ball that is delicious and nutritious at the same time. But before I share the recipe, I would really like to pay both nutritional and cultural homage to dates. Not only are dates an excellent source of fibre, as well as nutrients such as magnesium, potassium, and iron, they are also fat-free and rank low on the glycemic index scale. This means that despite their sweet flavour, the high fibre content in dates helps slow down the absorption of sugar they naturally contain. Dates are also one of the highest antioxidant-containing fruits on the market. There is scientific evidence from population-based studies that foods high in polyphenol content, which include many brightly-colored fruits and vegetables, may help reduce inflammation and the risk of certain diseases such as cancer and cardiovascular disease. Many cultures, including the Persian, enjoy dates in their original form, served with walnuts during afternoon tea or in incorporated into desserts, one of the most popular being Ranginak. Of the many date varieties, Medjool dates which are meaty and sweet in taste are the most popular in North America, but some Middle Eastern stores also carry the Halawi variety, which is smaller date variety chewier in texture. I prefer using the latter for recipes, because they can be pureed more easily without becoming too sticky during preparation. 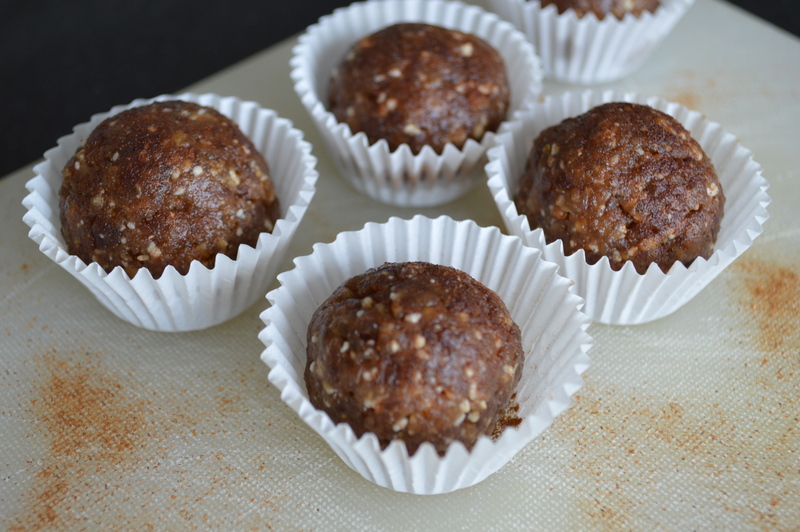 Now, here is the fun part – the recipe for Dani’s Vegan, Gluten-Free Date Bliss Balls. These take very little time to prepare, with most ingredients available in the bulk section of the grocery store (buying dried fruit, nuts, and spices in bulk, if you have no allergies, can help reduce your food costs significantly). I served Dani’s Date Bliss Balls earlier this evening to my “Persian Test Kitchen” with much praise, so perhaps they can find a place at your next tea time with friends and family, too. 1. Combine all ingredients, except for cinnamon, in food processor. 2. Using the basic food processor blade, pulse all ingredients into a paste. 3. Using a small scoop, portion paste into small balls, about 1″ in diameter. 4. Sprinkle with cinnamon (or roll in cinnamon powder) as desired. Tomorrow marks the day when many Iranians around the world celebrate spring equinox, or Norouz (“New Day”). As much as I love Norouz and the symbolism, tradition and culinary delights that accompany it, I appreciate Chahar Shambeh Souri even more. This event takes place on the last Tuesday before Norouz and is marked by a tradition of fire jumping – sounds strange, but it is quite a lot of fun, and many a pant leg have been subject to some lapping flames on occasion! I remember when, as a child, I was finally allowed to stay up until it was dark and go out into our public courtyard where I could watch what seemed like hundreds of people jumping over dozens of small fires, drawn to its light and energy like a moth to a flame. Yesterday marked the first day of spring, which Persians celebrate as Norouz. So I donned my forgiving drawstring pants, fork in hand, ready for the all-I-can eat Persian delicacies prepared by my mother. It takes days to prepare the ingredients and many hours to let all the flavours come together and meld and although I love to cook, I was very glad to just be enjoying the meal, rather than toil over its details. Apparently, it took my mother several hours to clean and hand-chop the fresh herbs for a dish called kuku sabzi, a frittata often made with egg, cilantro, parsley, green onion, dill, and spices (if you want a short cut, you can buy the herbs pre-chopped, but more traditional Persians frown upon this practice). No Eggs, No Milk? Yes, to Pancakes (with a Persian twist)! When I was a teenager, my Mother taught us to make pancakes, and I’ve been making them ever since, trying to experiment with variations on the standard recipe: blueberries, bananas, raisins, flax seeds, applesauce, and gluten-free flours (to name a few) have all had their turn as ingredients, with some substitutions producing more successful outcomes than others. On one particular weekend, however, I found myself with a craving for pancakes but faced with a shortage of two key ingredients: eggs and milk. Perhaps some of you have been here before, having already mixed all the ‘dry’ ingredients for the batter, and then realized most of your recipe’s ‘wet’ ingredients are missing. So, I had to improvise. Egg substitutes are generally chosen based on the intention of the egg in the recipe, so for pancakes, it would be to provide moisture. Instead of one egg, I decided to use a frozen banana that had been sitting dormant in my freezer for some time (when bananas start to get brown, I usually freeze them and use them in smoothies, and now, pancakes). A few seconds in the microwave thaws out the banana, which is then very easy to mash into a puree with a fork. In place of the milk, which provides both protein and moisture, I substituted 3/4 cup full fat Greek yogurt (strained yogurt or “Masteh Checkeedeh” in Farsi), which is very high in protein and 3/4 cup water. Over the years’ pancake practice runs, I’ve discovered that the fastest way to cook a pancake is to use a small skillet, which has a smaller surface area and heats up more quickly and evenly than a larger frying pan. The pancakes are also a smaller in size for those of us who wish to control our portions, and for those of us who have young children who for various reasons, enjoy food in its miniature presentation. 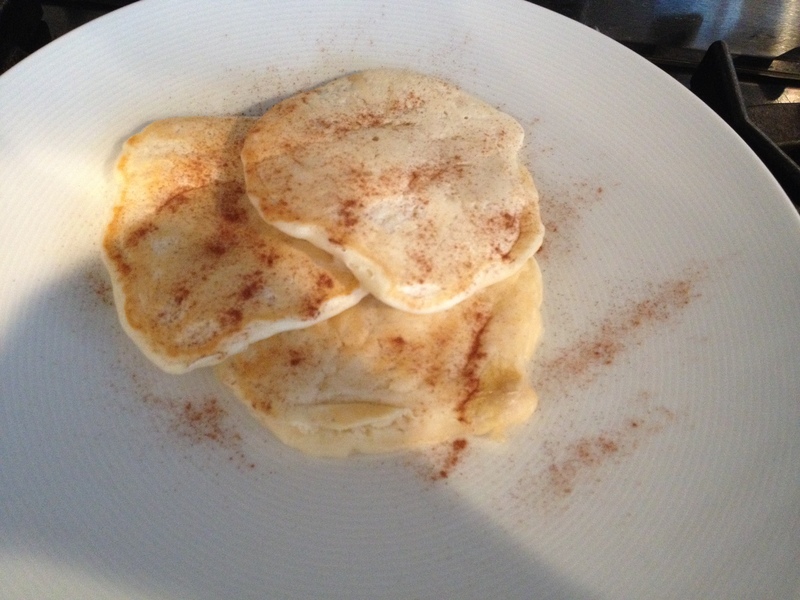 Using the substitutions and the small skillet, members of my testing kitchen described the pancake as delicious, tender, and flavourful especially when topped with ground cinnamon and cardamom for hint of Persian flavour. Noosheh Jaan! Yes, I may have taken a significant break from this blog, but I’m not idle in my silence. We, my Mom and I, are still cooking up a storm and experimenting with old and new recipes, trying to keep some of the traditional Persian flavours in the dishes, but also modifying cooking techniques to save time and minimize the number of ingredients we use. Since having twins in May 2014, I have garnered a whole new appreciation for time. This is why I love my oven. This fiery, yet magical place holds the key to food that is healthy, efficiently prepared, and packed with flavour. Such an example is Tass Kabab (not on a skewer, as might be expected), which is traditionally made on the stove top using a slow cooking technique to generate flavours and incorporating the exotic flavour of quince, a pear-like fruit that is difficult to come by at the best of times. The autumn being its growing season, you might find these golden beauties at Middle-Eastern and other eclectic grocery stores. So, although we love traditional Tass Kabab, we don’t have the time to stand over the stove and watch its every sizzling move, or shop for its obscure ingredients at a romantically leisurely pace. That is how we came to the following modification: instead of the stove top and dutch oven, we used a run-of-the-mill oven-proof dish and layered it with sliced onions, Roma tomatoes cut down the middle, and patties of lean ground beef ( you could substitute ground bison, chicken, turkey, or tofu patties according to your preference) . Now you might think that forming burger patties would be time-consuming, and you would be right. To save time, we prepared them ahead of time and froze them so all that was needed was to thaw them out in advance for a few hours in the fridge. 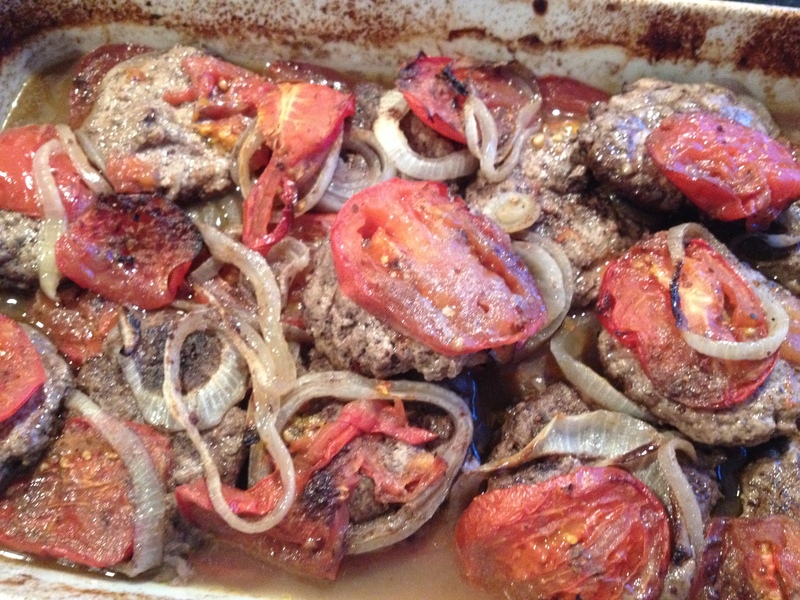 In order to retain moisture in the meat, we placed the patties on top of the sliced onions and topped them with the tomatoes and covered the dish with foil prior to placing it in the oven. The dish was topped with salt, pepper, and generous amounts of sumac, a spice with a lemony, fresh flavour to it that can be procured very economically at Middle Eastern Grocery Stores. The cooking temperature (375 degrees) and time (approximately 1 hour) in the oven are all that is needed to enjoy this Persian comfort food with leftovers to boot. A ‘sustainable’ Vegan Sushi Roll with only 4 ingredients, but a whole lot of taste. I have received some great feedback since my last post, Sushi Ethics, particularly with respect to my comment that our fish supply is threatened as a result of the growth of the North American sushi market. In fact, according to the National Oceanic and Atmospheric Administration (NOAA), the United States is ranked the second highest consumer of seafood worldwide, with China leading the polls. In terms of the bluefin tuna specifically, Japan is the leading consumer of this type of fish. Nevertheless, the extinction of fish species is a clear and present concern for all global citizens and choosing sustainably is a task for which we are all accountable. I was informed about a fantastic resource, called Ocean Wise, offered through the Vancouver Aquarium, which enables those interested to browse the sustainability indices of many fish species. Some of us Vancouverites may already be familiar with The Ocean Wise logo found on menus of some restaurants, but here you have the raison d’etre straight from the fish’s mouth. It’s about 30 years old, but it did the trick. Taking an English cucumber, washing and peeling it, then cutting it in half, I used this antique mandolin to slice the cucumber into strips lengthwise. I then shredded some carrots and cut a ripe avocado into small cubes. Using these ingredients as the filling, I rolled the cucumber strips similar to how one might roll a tortilla. I topped the rolls with a light drizzle of Bragg’s Liquid Aminos, which is similar in taste to soy sauce but lower in sodium and gluten-free. The best part was that the rolls took very little time to prepare and were delicious as well as filling if you ate enough of them (I think 20 or so should do the trick). I also think variations on this type of home-made sushi can be just as easy and delicious. For example, I might try using rice paper instead of cucumber and fill it with avocado, mangoes, sprouts and cream cheese. The world is literally your oyster.